We accept most insurances and bill your insurance company for you. We work with your doctor to ensure the correct “fit” before you leave. For short term needs we rent a full line of support devices including wheelchairs, walkers, crutches, hospital beds, nebulizers and more. Like most pharmacies, we are here to fill your prescriptions. But that’s only the beginning. Our highly trained staff is here to answer your questions and track your prescriptions to ensure no conflict between medications. We will work with your physicians to ensure you are receiving the correct medication and we’ll bill your insurance for you. We offer an online refill service as well as a mobile app to make make refilling your prescriptions as easy as possible. Want to transfer your prescriptions to Watkins? Just let us know and we’ll do the work. 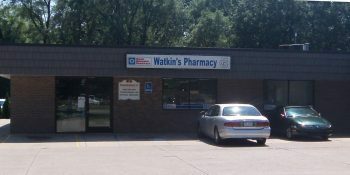 We’ll contact your existing pharmacy and move your prescriptions to Watkins for you. You have nothing to do. We will take care of it all. If getting out of the house is a hardship for you, Watkins offers delivery within a 5 mile radius of our store for a nominal charge of $3.00 per delivery.